Just as Garrick’s Juliet could awaken to meet her Romeo for a last farewell, and the Jubilee Procession and Continued Procession of characters could depart from Stratford to march across the London stage, so Shakespearean characters were effortlessly extricated from their originating contexts into daily life in late eighteenth-century England. 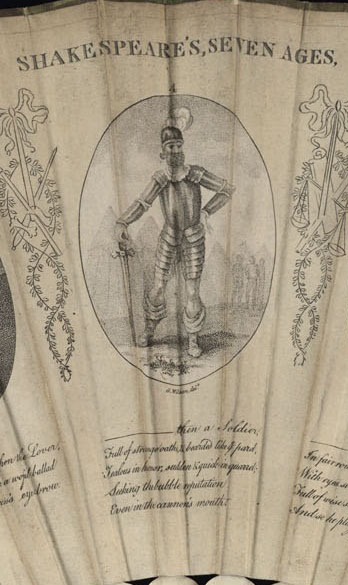 Shown here, a paper fan illustrating the trope of the “Seven Ages of Man,” taken from Jaques’s soliloquy in As You Like It. Already in 1709, Nicholas Rowe had excerpted the passage for commentary, in the introduction to his illustrated edition. 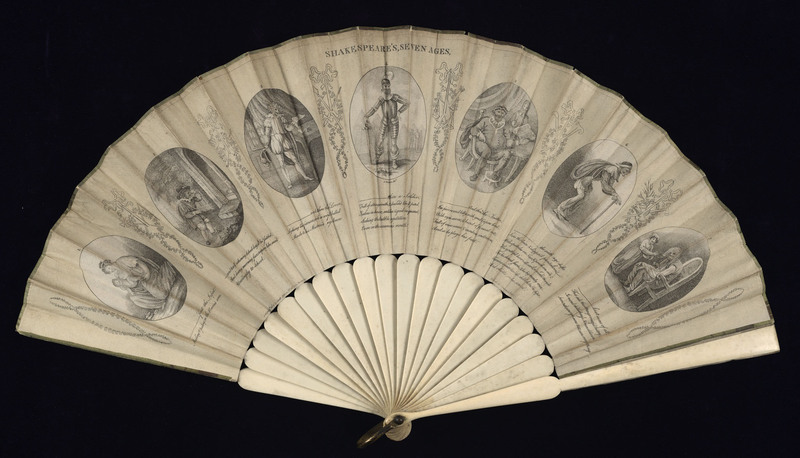 “His Images are indeed ev’ry where so lively,” wrote Rowe, “that the Thing he would represent stands full before you, and you possess ev’ry Part of it.” By the end of the eighteenth century, as this example shows, it was both possible and desirable to possess as material objects these “lively” images, and the “Thing” Shakespeare would represent.